So… what did I think about Vincent and the Doctor? Doctor Who is rightly praised for the extraordinary flexibility of its format. Not content with science-fiction adventure stories, the series can encompass political thrillers, bedroom farces, psychological horror, childish whimsy and pretty much anything else you can think of. Even when the series settles down and finds something it’s good at, like base-under-siege stories, a story like The Mind Robber will come along and upset the apple cart. Sometimes, like Troughton’s adventures in the Land of Fiction, these experimental efforts become generally very well-regarded. Others, fandom declines to clasp to their bosom quite so firmly, such as The Gunfighters. Still others remain controversial – loved by some, hated by many – such as Love & Monsters. 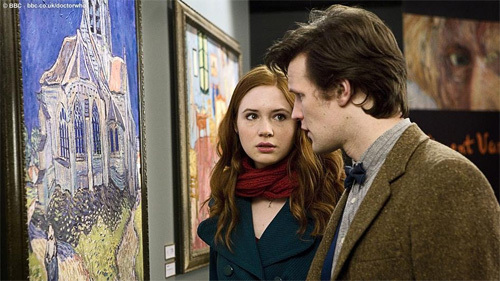 Vincent and the Doctor was certainly an experiment, tackling the psychology of depression while setting a beloved artist in his historical context, all shot through the prism of Steven Moffat’s “fairy tale” vision of the series, and including a few brief mentions of the ongoing series arc. I wholeheartedly support this experimentation with the formula. I also thought the results were almost totally unsuccessful. This is of course, merely opinion, and rash is the critic who attempts to give mere opinions the weight of facts. It is not true to say that Vincent and the Doctor is unsuccessful. Good friends and respected critics found it profoundly moving and exciting (and it is, of course, much less risky and exposing to sit on the sidelines and grumble about how manipulative a piece of art is, than to express your wholehearted admiration and love for it). It does, however, remain my opinion that Vincent and the Doctor did not work for me at all. The pre-titles sequence is almost identical to the opening of The Time of Angels, with The Doctor and Amy once again discovering something odd in a museum artefact and charging off to find out what’s wrong with it, only here it’s done without any panache or grace. It’s not at all clear why a visit to the Musée d’Orsay should be a special treat for Amy, not is it at all clear why there are in such a hurry to race back to 1890 given that 1890 will wait for them to get there for as long as they like. And the justification “I know evil when I see it” (one of a handful of poorly-dubbed Matt Smith lines in this episode) is paper-thin. So, the titles haven’t even run yet and already we’ve got a slightly awkward juxtaposition of a brief art history lecture and a sudden mysterious urgency to investigate a monster. On arrival in Provence, things brighten up a bit. Tony Curran is excellent both in appearance and in manner as the troubled Vincent, and his Scottish accent is incorporated with a sly gag. Director Jonny Campbell recreates van Gogh’s paintings in his compositions without making too big a deal of it, and the story begins to settle down. At this point, I would have been perfectly happy if this had simply been a story of what happens when van Gogh met the Doctor and Amy, but up pops an invisible monster to remind us that this is Doctor Who. Sigh. The Krafayis is generally rather poorly realised with the Doctor not even facing the same direction as van Gogh when attempting to attack it, bits of scenery occasionally falling over, but never creating the impression that a creature is moving around, and actors being hoisted up on wires or falling over in a slightly embarrassed fashion. Why it isn’t killing dozens of people isn’t made clear, nor is there any real connection to the rest of the story. Between only van Gogh being able to see it (and paint it), the Krayfayis itself being blind and van Gogh’s impassioned rant about being able to hear colours, Richard Curtis obviously has something in mind about what one person can see and another can’t, but it never really comes together. I suppose allowing these two plotlines to merely touch instead of intersect is preferable to desecrating van Gogh’s genius with some science fiction nonsense about his visions of the world being due to an excess of midichlorians in his blood, but the overall impression is still of a perfectly good, if slightly patronising, story about Why Vincent Van Gogh Was Sometimes A Bit Sad But Still A Jolly Good Painter, rudely elbowed out of the way for some rather clumsy science-fiction slapstick. And then the Krafayis is dead, stabbed with an easel if that’s supposed to make this feel like more of a piece, with 15 minutes to go, which means we get undoubtedly the most questionable sequence of all – van Gogh’s return visit to the museum. Firstly, this is – for my money – somewhat overplayed at best. To the soaring strains of emo-pop, we hear Bill Nighy eulogise van Gogh’s art while the poor man stands and listens. I know it’s meant to be an uplifting and heartbreaking and yet ultimately sensitive depiction of depression, but to me it felt glib and sentimental without really connecting with anything. Secondly, and perhaps more seriously, the Doctor’s attitude towards this troubled soul’s mental health seems to me to be wildly cavalier (being shown this kind of future might drive anyone mad) and the lack of impact on the rest of van Gogh’s life, while probably truthful, did render the exercise slightly pointless. Ultimately, I simply struggled to accept the reality of any of it – even within Doctor Who’s loose fantasy context. I knew what the scene wanted of me, but I just didn’t feel that it had earned it. As ever, there are pleasures to be had. In the scene where van Gogh, the Doctor and Amy lie on their backs looking at the stars, we get a vision of what a more restrained, more controlled, more truthful version of this story might have looked like. I’d cheerfully watch Bill Nighy (uncredited for some reason) count backwards from 1000 and I’ve no doubt he’d make it a fascinating experience. Matt Smith is absolutely brilliant once again, even when the script only gives him falling over to do, it was nice to get that quick name-check for Rory and I loved the TARDIS being fly-postered, and those posters burning off in the vortex. Ultimately, however, this was my least favourite story of the series so far, with the sole exception of Victory of the Daleks, which slips lower in my estimations with every passing day.